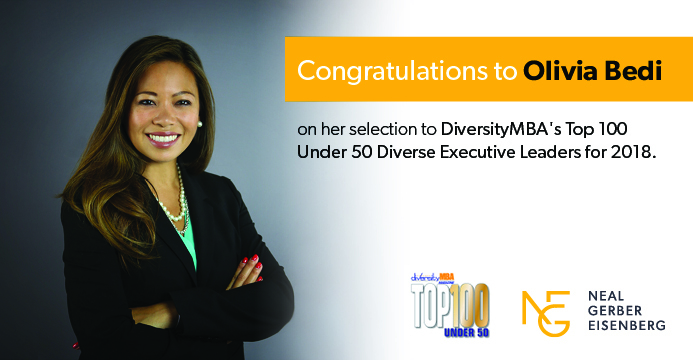 Neal Gerber Eisenberg is pleased to announce that Olivia Luk Bedi, partner in the Intellectual Property practice group, has been selected for DiversityMBA’s Top 100 Under 50 Diverse Executive Leaders for 2018. DiversityMBA’s list honors talented professionals with advanced degrees who have made a tremendous impact on leadership in their companies and communities. The honorees are selected from a broad spectrum of companies with a global reach. Olivia is an intellectual property litigator who represents individuals and corporations across the country in complex technological matters. She helps clients protect, enforce, and defend intellectual property rights, including patents, trade secrets, copyrights and trademarks. Her industry-diverse practice includes the fields of biochemistry, chemistry, computer engineering, electrical engineering, metallurgy, nanotechnology, software design, and mechanical engineering, among others. An experienced trial lawyer, Olivia has litigated and tried significant cases before the U.S. District Court for the Northern District of Illinois and other federal courts around the country, and has also briefed and argued patent appeals before the Federal Circuit. She also devotes a substantial amount of her time to pro bono service. In 2018, she won the Excellence in Pro Bono Service award, presented by the U.S. District Court for the Northern District of Illinois and The Chicago Chapter of the Federal Bar Association.